Our Desert Tortoise has a lot of personality, he really does. He likes to wander and explore- which led to trouble. I had either left the side door to the garage open or not completely shut, somehow he got into the garage. My wife came home for lunch and ran over something in the garage. She backed up, got out to see what it was. She called me in a panic, saying "I killed our turtle!" His shell was cracked and there was a puddle of blood (which my daughter cleaned up). I rushed home and we took him to the local animal hospital. He stayed over night and is home now. I think he will be ok now as long as we take good care of him- we have to give him injections for 8 days (starting today 9/10) and keep him inside for awhile so that he doesn't get an infection. Seeing him after the accident I didn't think he was going to make it, but now I do. Mr. Turtle has gone into hibernation. He is in his winter quarters- a large plastic tub in our garage. What a pampered darling Mr. Turtle is! He gets a holiday retreat and new digs in the new season. I hope he has a long and happy life. Finally going to rain around here so Mr. Turtle is vacationing in the garage for now. We are going to build him a shelter to replace his now filled in burrow- one that will last. Mr. Turtle cracks me up! He's got a lot of personality, that's for sure. I laughed about his overnighter in the old tire. It's a good thing that the neighbor's dog (who was blamed for Mr. Turtle's burrow escape hatch) did not actually get a hold of that mischievous guy. It's wonderful that your neighbour helps you to take such good care of Mr. Turtle. Mr. Turtle's burrow is right at the fence line, he actually lives underneath my neighbor's back yard. My neighbor thought his dog had dug a hole so he filled it and put some rocks over it. Then he noticed the rocks were moving. So we moved Mr. Turtle into a container in the garage (he's supposed to be asleep anyway but California skipped winter this year.) Not quite sure what we will do but we will figure something out. Mr. Turtle is more active than ever, he is really moving these days. He has a huge appetite and eats everything we give him. I'm going to block his access to the side of the house, lately he has been scratching the stucco off the wall. He had one of his famous mishaps a couple of days ago: My daughter had got a flat tire, which we replaced. The old tire was in her trunk so I put it on the side of the house, I plan to dispose of it this weekend. I found Mr. Turtle trapped inside the tire in the morning- so he spent the night inside an old tire. He has more lives than a cat. Welcome to (almost) spring, Mr. Turtle! Glad to hear he's out and about in this lovely weather! I'm amazed that Mr. Turtle woke up exactly on the same date as he did last year. all I could think of was, "Wow!". I love hearing stories about Mr. Turtle, because I never realized they actually have a personality, but thanks to Dan and his stories, my view is different now. I bet he's looking forward to eating some dandelion flowers. Happy Spring, Mr. Turtle!! Sunday, March 10 Mr. Turtle woke up from his winters hibernation. After sunning himself did a little grazing, we gave him some water and then he went back to his burrow. Going to be in the 80's this week so he'll start roaming further in the yard and staying out of his burrow longer. and happy spring :) So glad you made it through the winter. Mr. Turtle emerged from his burrow today. He only ate a little but he drank a lot of water. His breathing is good, he seems to have beat the pnemonia he had last year. I'm sure Mr. Turtle had a great adventure, but I'm really glad you know how he got out and can fix that problem. Some adventures are not so good. It's wonderful that he's safe! Pulling into the drive way today after work I noticed the side gate was wide open. We searched the yard and could not find Mr. Turtle. Went around and asked if anyone had seen him. Yes they had. The first neighbor I talked to said yes, the people down the street had seen it. The next person I asked said he was in the street so he put him in the nearest yard, not knowing where he belonged. We rang their doorbell, they said yes that their daughter had seen him. Two other neighbors said they hadn't seen him. We went around the corner, I thought I saw him but it turned out to be a basketball. Then my daughter spotted him in someone's front yard- about a quater mile away and across the street. The gate will ALWAYS be locked from now on. Dan, thanks for giving me so much information on how to care for a tortoise. We found a little one make a slow go of it in our back yard last night. I wasn't sure what to do for him. We knew it was a little to cold for him so we put him in a box with some shredded paper and a little lettuce and brought the box in the kitchen. This morning he was buried in the paper. You gave me some more ideas on how to keep him safe, warm and feed proberly. 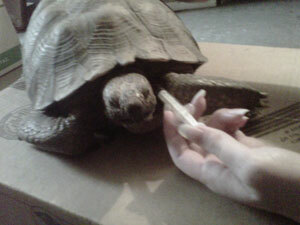 Sharing what your tortoise likes to eat helped alot. Thanks for the info and will keep you updated. Thank you to Dan who sent this photo to show how his family handles tortoise injections. He also wrote a bit about this to help others. Hello, this picture is of my daughter giving a shot to our Tortoise (Mr. Turtle). on his front left side. It's so much easier then the giving the shot in the back side where the skin is much tougher. He has two more shots left and is getting much better. Dan, I really like your updates. And I also like how well you take care of the tortoise who lives with you. I'm glad he's doing better even though he got confused and came out early. Mr. Turtle, the Desert Tortoise, got fooled by our up-and-down weather. He came out of his burrow and started hanging out on our slope, we didn't know he was out and about. It turned cold and rainy. After the rains I was out back and I could hear him breathing, had to dig him out of the Ivy. The awesome vet at Lomas Linda Animal Hospital gave us anti-biotics which we have to give him (injections once a day for ten days). He's just about done and breathing much better. I knew he would come around, having survived being run over this was a piece of cake for him. Harder on us, the injections are hard to give with that tough skin! Well, our Desert Tortoise appears to be healed. He'll be going back home soon (our back yard). At first glance you would never guess that he had been hit by a car, until you see where his shell got cracked. He walks normal and is still a social animal. Thank you for sharing your good news. I always like to hear about turtles and tortoises who are doing well. Mr. Turtle is doing much better these days. He is walking better and seems to be adjusting to life indoors. The vet told us that we shouldn't let him hibernate this winter so he now has a room inside the house. At this rate we should be able to let him return to his usual living quarters next summer- the back yard. I found it to be interesting. Maybbe it's the way you talk about your tortoise - I just didn't know a turtle could have that much personality. You took good care of your tortoise. I hope you will post back here and tell us what happens.